To be, or not to be, that is the question. Is Shopify Plus good enough to switch to? What are the main differences between well-known Shopify and its Plus version? Its leading competitors, advantages, disadvantages and many more you’ll find in this article. Scroll down to see what we’ve prepared for you today. Everything you need to know about Shopify Plus is right around the corner. Shopify Plus is a robust e-commerce platform created by Shopify’s enterprise for all types of online business. This makes it one of the most popular platforms for running high-level business that includes a significant number of customers and high traffic volume. It is hosted e-solution and is ideal option for large corporations of the highest levels. The platform is home for a lot of world famous brands, such as: “Colour Pop,” “Kylie Cosmetics,” “Pixi,” “Gymshark,” “Kith,” “Nice Laundry,” “Venroy,” etc. This list of influential brands, which partnership with Shopify Plus proves its reliability and robustness, have also made well-earned platform’s reputation. But does it matches included features? 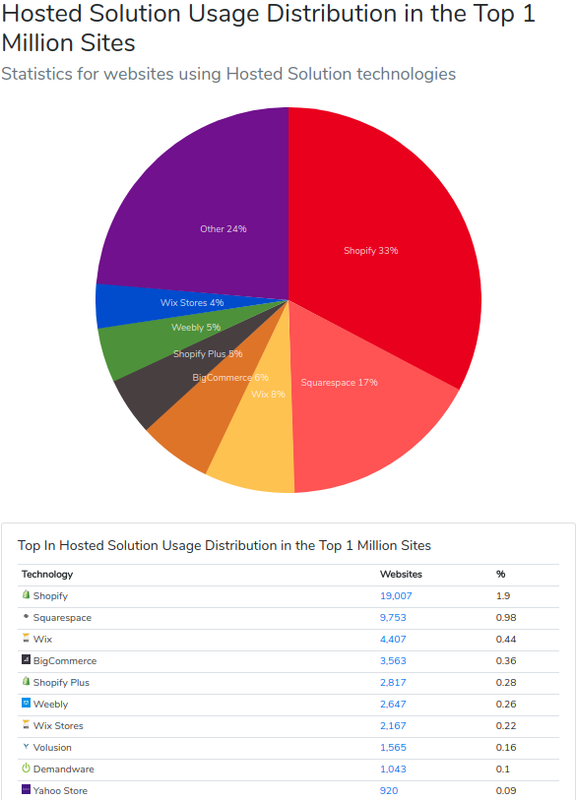 What makes Shopify Plus the 6th most popular platform in Top 1 Million sites in Hosted Solution category? Look through the items below to reveal all misunderstandings and discover the secret of crazy fame that grows speedily from day to day. Have you ever evaluated the whole list of hosted platforms’ benefits? No server worries, almost unlimited features set, limited security risks and total easiness in scalability. Are you nodding in reply now? Yes? Than fully hosted Shopify Plus is your ideal place to stay. Remember how much time it takes to do everything on your own with self-hosted platforms? With this e-solution you’ll see it only in dreams. Easiness and simplicity - two words that come to mind after using this e-solution. Annoying, stressful code breaking, hiring expensive platform development are far away in past. Shopify Plus will deeply care about your e-business. You’ll be shocked how easy it is to add a new product since the whole backend work is already done for you. Do you like this feeling of self-uniqueness. Yeah, we all love it. Shopify Plus have found the way to provide its customers with this delightful moment. And it’s the most extraordinary way you’ve ever seen because this is Shopify Plus pricing methods. There are custom fees for each client. Request a quote to discover the ultimate price. As a rule, they start at approximately $2,000 per month. It is very comfortable because of there no need to overpay. Final price depends only on separate case. It includes the number of products to sell and the set of demands for your e-business. Everything is in your hands and under YOUR control. Dedicated account manager. Do you know what it is? It is the other name of calm and confidence. Included launch managers, merchant success managers, and 24/7 priority support will give you guidance on how to hold up the whole structure of business. In case you need it, of course. Shopify Plus is the area where everything is affordable. This applies to customization options too. Here you can modify to customers’ expectations whatever you want: design, products, and many more. The best part of it - you can do it on your own. Send your developer on vacation without any doubts because no technical skills are required. The ability to automate full-scale campaigns, create personalized journeys for shoppers, offer direct selling with social media and provides intuitive payments - all for your clients’ satisfaction. Shopify Plus features make your life easier step-by-step. To save time and efforts, Plus-team has paid great attention to automation aspect. Complex Shopify Flow makes it fairly easy to control backend workflows and reduce complexity with an easy-to-use visual builder. Take an overwhelming advantage from integration possibilities. In order to optimize management, Shopify’s API directly integrates with your OMS, PIM, 3PL or CRM. Business systems and applications are also included: MailChimp, QuickBooks, Fulfillrite, itDuzzit, Zapier, KISSmetrics, Chargify. 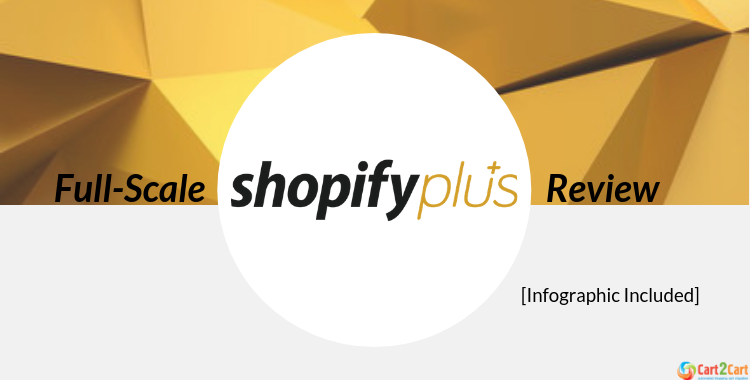 Here we’re going to present other privileges for Shopify Plus clients. Yes, I mean GiftCard, Multipass, and User. Experienced e-businessmen claim that the best thing available in this platform is its vast marketplace of 3rd party apps. Missing a marvellous opportunity to run business smoothly is a real sin. Using Shopify Plus means running with big dogs. It will be more comfortable with such apps as Klaviyo or Rare.io. to integrate targeted email marketing campaigns. Or increase the number of clients with LoyaltyLion and SMILE.io, which generate customer rewarding campaigns. But the best part here is the opportunity to chat with your customers via Facebook. This is a good chance for your clients to get real-time support or consultation without any struggle. At the same time, you can monitor customer's interest by tracking their in-store behaviours, recommend products to increase sales, and keep long-term customers happy. After all, there’s nothing to add. Shopify Plus is a chance to boost online business and leave competitors far behind. The natural question here: “What about Shopify? Is the Plus version surpassed one of the most powerful e-commerce platforms?” Let’s check. There are major differences between Shopify and Shopify Plus. The second one was created as more strong and robust solution. It is the world’s fastest growing e-commerce platform which moves rapidly. Now it powers more than 500,000 stores, while Shopify (launched 8 years earlier) is home to over 600, 000 stores. Both are excellent online business solutions, and users are equally satisfied with two versions. As always, the choice depends on your needs or preferences. Let’s clarify the main distinctions between them! #Without limits! Up to 500,000 hits per minute and 99.97% website uptime. Now is time to say “wow.” Yes, Shopify Plus gives you the opportunity to run a prominent and successful online business without any bugs and unavailable site at the most inappropriate moment. This is the first difference. #Attractive pricing. As it was mentioned, Shopify Plus offers only custom fees for each client while Shopify pricing plans vary from $29 per month to $299 per month (“Basic Shopify” - $29, “Shopify” - $79, “Advanced Shopify” - $299). There no answer again which variant is better. Run you a small business or a huge company - both of them are acceptable. Check the whole list of features included and choose a pricing plan with Shopify or request a quote and agree on individual characteristics with Shopify Plus. Believe, in both cases, you’ll win. #Simplicity and ease of use. If you have to name three main challenges you’ve faced using an e-commerce platform, one of them would be complication with coding. Don’t be afraid, with both Shopify and Shopify Plus you can forget the “Do I need to know how to code?” question. Everything is effortless, and no expensive developers are required. Besides these platforms are similar here, there are improvements which you can observe only in Plus version. Their team has made a breakthrough, and you don’t need to manage orders. Shopify Plus software will do it for you. So save some time and pay attention to other aspects of running business. #Domain checkout. Great news for those Shopify users whose dream is to have the same domain checkout. Previously you had to redirect shoppers to checkout under a Shopify web domain. This process often led to losing potential customers because they felt confusion. Shopify Plus allows you to remain consumers on the same domain when checking out, providing a better shopping quality. #API. Shopify has a vast number of APIs to make your online store work perfectly and rapidly integrate complex Shopify range of capabilities into your app. There's an opportunity for data displaying on your store page from an outside location with Application proxies. Or edit/delete new fulfilment services. This and many more you’ll achieve with its service. What about Shopify Plus? Here you will have many more. The advanced API’s will let you benefit from integrations. Relate CRM, accounting, or multi-channel software with your store to make the whole process run like a clockwork. Don’t forget about available access to top-rated Shopify applications, Justuno for example. This will help you with your conversion optimization needs. #Multi-store. Have you heard about clone stores? If your current platform is Shopify, perhaps, the answer is no, because of there no such function in this e-solution. The option gives you the possibility to create several versions of the store and manage them from one account. With this e-solution you can build these stores and manage them efficiently. This will bring you the opportunity of internationalization and regional support. You can also synchronize orders, inventory or customer data across the stores. #Transaction fees. Shopify users pay from 0.5 to 2 percent for transaction fees. There is a positive change in this matter with Plus version. Here you have to pay less than 0.2% because all depends on your shop's revenue earn. This is a significant change. Shopify Plus isn’t the only strong platform, but it’s one of the best e-commerce solutions available today. But there are many worthy opponents, so let’s analyze the most competitive to realize the whole situation. 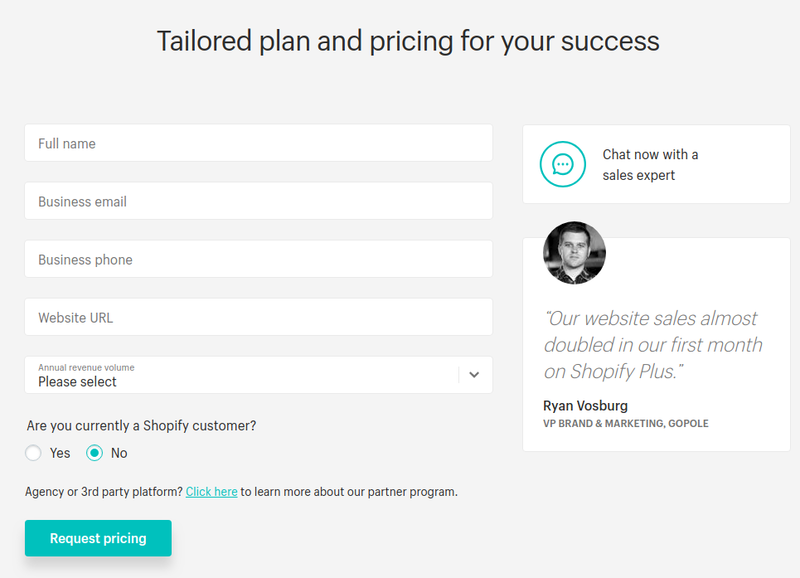 Our in-depth Shopify Plus review contains all key benefits you get from choosing this software solution to build your e-store on. This e-solution will provide you with extensive functionality to succeed in online trading and achieve even the most challenging goals. This e-platform has a winning number of advantages. You’ll be satisfied with custom pricing because everything depends only on you and your store. Shopify Plus’ own payment gateway will get rid of difficulties with payments methods. Multiple sales channels, unlimited bandwidth and number of products - these all are available with the platform. Here you don’t have to predict your customers’ preferences, because Google’s enhanced e-commerce analytics engine will provide you with all the information about customers’ interests. In addition to your own online shop, there is an opportunity to sell on major social networks and marketplaces. And don’t be afraid to meet technical challenges because customer service is available 24/7. Sleep tight because constant support is provided. If you’re a big business shark, this is a golden opportunity to feel the total freedom from limitations. The Plus plan is created to cope with the heavy traffic. You won’t lose a penny because all shoppers will meet the great service on your website. All apps are built professionally, so there are no bugs and malfunctions. Benefit from cooperation with expert designers, developers and profitable partners. That’s the fact that all Shopify Plus based stores are famous and make profit. You know why? Because here the digital marketing is on the highest level and has all the standard tools that marketers look for. Throw away all doubts about staying with your current e-solution and moving to Shopify Plus? And say goodbye to your fears concerning migration details? Try Cart2Cart service and forget all these worries. We’ll provide the smoothest Shopify Plus import you’ve ever seen. Benefit from effortless 3-step migration, the widest range of transferable entities, amazing migration speed, 24/7 support and assistance 100% current store uptime and the main advantage - Free Demo Migration . Don’t waste your time! Try the new advanced platform right now and be one step closer to your dream online store. 2 thoughts on "Full-Scale Shopify Plus Review: Features, Pros and Cons, Comparisons"
I am reasonably certain I’ll learn many new stuff right here! Dear client! Thank you for such an inspiring commentary! We really appreciate your warm words concerning our blog posts. Cart2Cart is looking forward to hear from you more!